For the little chaos-maker in your life! New to cables? Want to do a fantastic, all-over cable pattern but feel intimidated by following a complicated chart? 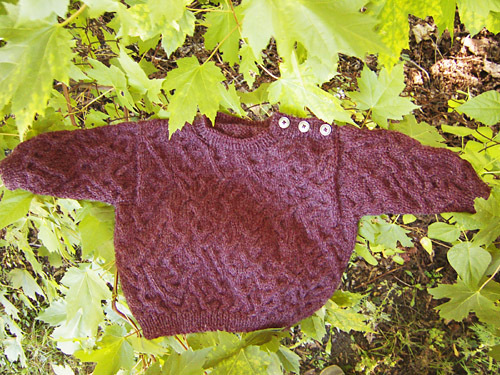 This baby's pullover has a striking, all-over cable pattern with no chart at all. Instead, this sweater is covered in a chaotic, random cable pattern generated by rolling a die -- great fun for a little (or big) helper! 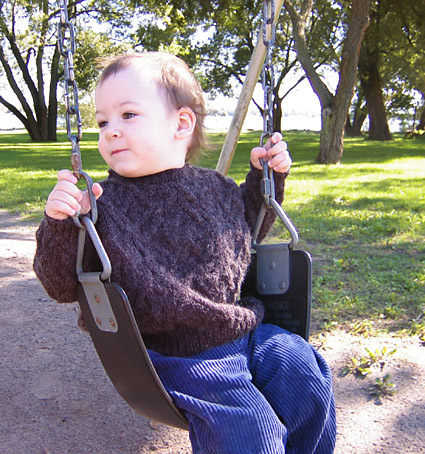 This sweater has a loose fit to allow for easy movement, but has a ribbed waist and cuffs to keep baby warm, plus buttons at the shoulder to allow for easy dressing. Chaos is knit in Tivoli Woolbend 400, a durable, washable blend of acrylic and wool. I chose a sophisticated, dirt-hiding shade of charcoal heather, though many other shades are available. 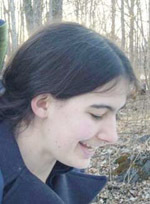 Read about the origins of the random cable pattern at Mary Griffin's website. Note: If you wish to substitute yarns, you will need approximately 290[355, 420, 500] yd/265[325, 385, 455]m of aran (or heavy worsted) weight yarn. The first and last two sts of every row are knit. Do not work a cable twist over the last 4 sts of a row. It may be necessary to "cheat" a little if you get a large or small number of cables in succession. If your knitted fabric was infinitely large, any cluster of cable stitches would be balanced out in the long run by clusters of knit stitches. But since this sweater is made using a limited number of stitches, especially when dividing for the neck, you may need to ignore or insert a cable to keep the fabric fairly flat and even. For example, if you roll 1-1-1-1, you may change this to 1-1-3-3-1. Or if you roll 3-3-4-4-3-3 you may change this to 3-3-2-3-3. However, don't give in to the temptation to "cheat" too often (more than once per row or so) or you may compromise the randomness of the pattern. Treat this cable pattern like the child you're knitting it for; don't be completely unbending with the rules, but don't be overly permissive, either. Rows 2 & 4 [WS]: P all sts. If you roll a 1: Slip next 2 sts to cable needle and hold to front of work, k2, k2 from cable needle. If you roll a 2: Slip next 2 sts to cable needle and hold to back of work, k2, k2 from cable needle. If you roll a 3: K2. If you roll a 4: K2. If you roll a 5: Roll again. If you roll a 6: Roll again. *Using smaller needles, CO 54[60, 64, 68] sts. Work 10 rows in 1x1 Rib. Next Row [RS]: Using larger needles, k5[8, 6, 4], [m1, k4] 12[12, 14, 16] times, k1[4, 2, 0]. 66[72, 78, 84] sts. Begin working Random Cable Pattern. Work in patt until work measures 6[6.5, 7, 7.5] inches, ending with a RS row. Next Row [WS]: P2, p2tog, p to last 4 sts, p2tog, p2. 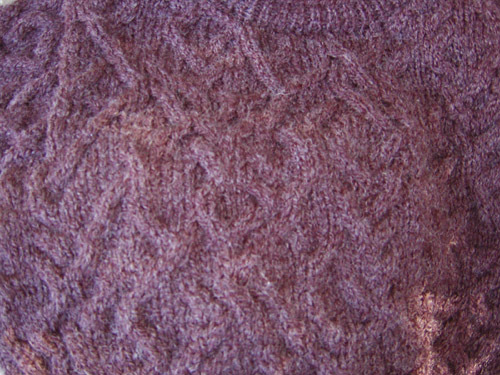 Cont in patt until work measures 10[11, 12, 13] inches (armhole measures 4[4.5, 5, 5.5] inches), ending with a RS row. Next Row [WS]: [P3, p2tog] to last 2[3, 0, 1] sts, p to end. Work as for Back from * to *. Cont in patt until work measures approx. 8[9, 10, 11] inches, ending with Row 1 of Random Cable Pattern. Next Row [WS]: P22[25, 25, 28], p2tog, p4[4, 6, 6], p2tog, p22[25, 25, 28]. 50[56, 58, 64] sts rem. Next Row [RS]: K17[19, 19, 21], ssk, k1, place 19[21, 21, 23] sts just worked on st holder, BO 10[12, 14, 16] sts, K1, k2tog, k to end. 19[21, 21, 23] sts on needle. Next Row [RS]: K1, k2tog, work in patt to end. Repeat these 2 rows twice more. 13[15, 15, 17] sts rem. Cont in patt until work measures 10[11, 12, 13] inches, ending with a RS row. Next Row [WS]: [P3, p2tog] 2[3, 3, 3] times, p to end. 11[12, 12, 14] sts rem. Note: Left shoulder is 1 inch shorter than right shoulder to allow space for shoulder button band. Replace held sts on needle with WS facing, rejoin yarn. Next Row [RS]: Work in patt to last 3 sts, ssk, k1. Using smaller needles, CO 20[24, 28, 32]sts. Next Row [RS]: Using larger needles, k4[6, 4, _], [m1, k4] 4[4, 6, _] times, k0[2, 0, _]. 24[28, 34, _] sts. Next Row [RS]: K2, [m1, k4] 7 times, m1, k2. 40 sts. Next Row [RS]: K2, m1, place marker, work Row 1 of Random Cable Pattern to last 2 sts, m1, k2. 26[30, 36, 42] sts. Next Row [RS]: K2, m1, work in patt to last 2 sts, m1, k2. Repeat these 2 rows 6[5, 2, _] times more. 40[42, 42, _] sts. Repeat these 4 rows _[1, 4, 7] times more. _[46, 52, 58] sts. Cont in patt until work measures 5.25[6.25, 7.25, 8.25] inches, ending with a RS row. Next Row [WS]: [P3, p2tog] to last 0[1, 2, 3] sts, p to end. Block all pieces to measurements given in schematics. With RS of back facing, measure 2.5[2.75, 2.75, 3] inches in from corners along bound-off shoulder edge, and mark with safety pins. Sew right shoulder seam from armhole edge to front neck edge, matching front neck edge to safety pin near right shoulder. Remove this safety pin. With RS facing, using smaller needles and beg at left front neckline, pick up and k 3 sts for every 4 rows and 1 st in each bound off st around front neckline, and along back neckline to remaining safety pin. Work 7 rows in 1x1 Rib. BO loosely using larger needles. With RS facing and using smaller needles, pick up and k 5 sts along edge of neckband and 1 st in each bound off st along left back shoulder. 16[17, 17, 19] sts. Work 7 rows in 1x1 Rib. BO all sts. With RS facing and using smaller needles, pick up and k 1 st in each bound off st along left front shoulder, and 5 sts along edge of neckband. 16[17, 17, 19] sts. Work 3 rows in 1x1 Rib. Next Row [RS]: Work 2[3, 3, 3] sts in patt, yo, w2tog, [work 3[3, 3, 4] sts in patt, yo, w2tog] twice, work rem 2 sts in patt. Work 3 more rows in patt. BO all sts. Sew buttons to button band opposite buttonholes. Fasten buttons and pin armhole edge of button band and buttonhole band together. Sew sleeves into armholes. Sew sleeve and side seams. Josie is a full-time mom in Belleville, ON, where her husband, toddler, two cats and a closet full of yarn all vie for her time.